Alana Rose became a big sister on Monday. She's excited about her new little sister. She's a real live baby doll that Alana can play with or at least try to play with. 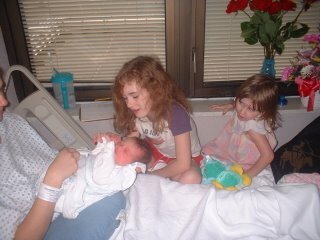 She is already trying to share her toys with her newborn baby sister Seanna. She's tried to share her food too although I tried to explain that Seanna couldn't eat yet. She really likes to help take care of Seanna. She helps me change diapers and is fascinated by Seanna nursing. She's a good big sister, I just hope the charm of having a new sibling doesn't wear off.